Mainly it’s down to the even more awkward fact that what Hugo Chavez did to Venezuela is pretty much exactly what Corbyn and his cronies plan to do to Britain. Think it could never happen in the land of Magna Carta? There are three stages to the “revolutionary process” which will transform Britain into a socialist utopia. The first — “a substantial and sustained shift to the left in the labour movement” — has already happened. Moderates in the Labour Party have either been ousted or subdued to the point where they are thinking of forming a new centrist party. The hard left have dominated. Stage three is the even scarier part. One of the Communists’ great fears is that Britain will then follow the “example of Chile”. That is, as with the glorious revolution that brought socialist president Salvador Allende to power, there will be a counter-revolution (encouraged, of course, by the evil United States) which will undo all the glorious work of the left and force yet another right wing government on the helpless proletariat. In response, a left government “will use all the official and popular forces at its disposal to crush each and every attempt at military subversion, rebellion or invasion”. A new paramilitary force — “the state’s corps of military reservists” — would gradually replace the army. Linked with “large workplaces and local working-class communities”, its recruitment, education and administration would be overseen by the trade union movement, an echo of the political commissars attached to all Soviet military units. The Communist Party of Britain (CPB), it’s true, is not in itself a significant electoral force. In 2017, it had a total of just 734 members; and in the 2015 general election, it gained a grand total of 1,229 votes. Unfortunately key figures from CPB, including Andrew Murray — the man believed to have had a hand in writing the 2011 edition of Britain’s Road to Socialism — are now Jeremy Corbyn’s key advisors. Well personally, I think we’re already well past Peak Corbyn. In the most recent YouGov poll, his popularity hit an all time low. But the worrying detail here is that the decline had more to do with his wavering position on Brexit than it did with his left-wing lunacy. When we asked people who had turned against him, Brexit was mentioned overwhelmingly as a reason. It was about his indecisiveness, playing politics with Brexit and refusing to meet Theresa May. 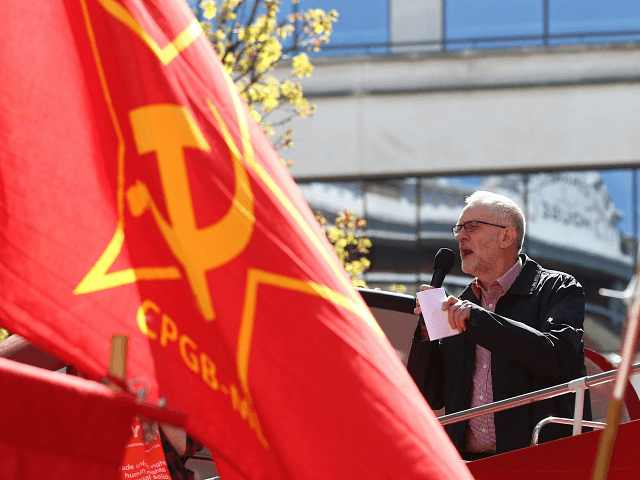 The reason for Corbyn’s ambiguity on Brexit is that he, like many of his hard-left inner circle, sees the European Union’s regulations as an irritating constraint on his ambitions to implement full Communism in the UK. In other words, Corbyn is secretly as pro-Brexit as Jacob Rees-Mogg but he just can’t admit it. Sure, it would make him more popular in the Labour voting strongholds of the north, but he’s probably got their vote anyway. More important to his strategy is to avoid giving Theresa May’s shaky government any more support than is necessary. So it suits him to sit on the fence: that way, there’s more of that much-needed instability which, he hopes, will lead to the wave of popular frustration which propels him into power. If history weren’t taught so badly in schools, everyone would know that Communism — or “democratic Socialism” or whatever fancy euphemisms the hard-left uses to mask its intentions — has failed everywhere it has been tried. But a lot of people in Britain either don’t know this or are naive enough to imagine that next time will be different. Corbyn’s PR machine nurtures this delusion by presenting him as a harmless avuncular figure who just wants to bring about social justice in a world brought low by the failed model of capitalism. Chavez was just the same. Before he came to power, he was very careful to present himself as a moderate figure — certainly not the type to do anything so radically left wing as nationalise all the industries, confiscate everyone’s assets, and imprison his critics. Corbyn probably won’t get as far as Chavez did — and consequently won’t enter nearly the same league of infamy. But it won’t be for want of trying. If the Corbynistas ever get their buttocks on the seat of power, what seems like a joke today will suddenly seem very unfunny indeed.